Using this site you can study the kanji learned by elementary school students in Japan and textbooks such as "Genki", "Minna no Nihongo" and so on. More than simple a kanji dictionary, this site is more like a kanji database, complete with tons of example sentences and quizzes. You can search for the kanji learned by Japanese elementary schoolers and those found in textbooks like "Genki", "Minna no Nihongo", "Nakama", "Youkoso" and so on. 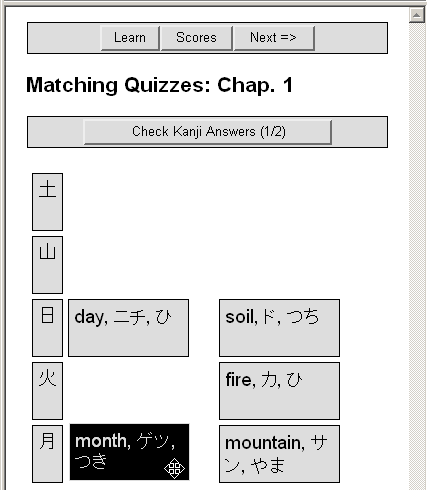 As there are plenty of quizzes, you can check your own kanji knowledge. 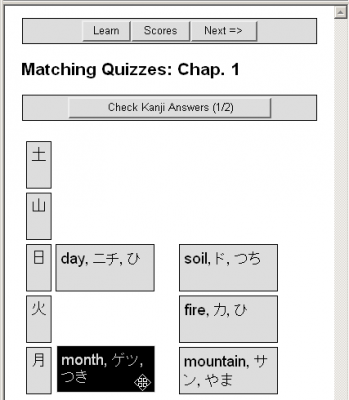 You can see a list of example sentences for a particular kanji or kanji word. Here you can watch an animation of how to write the kanji. Check your understanding by trying out some simple quizzes from the Quizzes button. This is the quiz screen. You're asked to match the correct meaning and reading with the kanji. If you adjust the screen to make it a bit narrow before you click the game button, you'll find it easier to move the right side buttons to left side kanji button. These contents are part of uPal:(United Portal for Advanced Learning) (Introduction article).